No need for a Base or Junction Box with the Brand New Concept Pro Compact Fixed Lens Dome from Videcon. 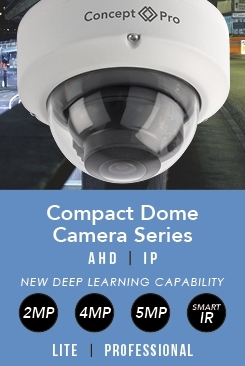 Concept Pro’s new Compact Fixed Lens Dome Cameras come with cable connections inside the camera housing, removing the fly lead and any need for a base or junction box. Split into Lite and Professional cameras with2 MP and 4MP options in IP, and 2MP and 5MP AHD, multi-signal (AHD, CVBS, TVI, CVI) formats there is a camera available to suit any budget. Housed in solid metal, the range of cameras are all IK10 and IP67 rated. AHD cameras feature a DC12V output, allowing for the powering of auxiliary devices through the camera. The 4MP IP model features Audio In/Out and Alarm In/Out and all IP models are compatible with Video Analytics and Deep Learning Video Analytics when used with a Concept Pro NVR. Internal Cable Connections terminated inside the camera housing resulting in no fly lead and no need for a base. DC12V power output on AHD Cameras to power auxiliary device.